Man, it’s been awhile since I’ve blogged! I guess I just haven’t been in a writing mood recently — alas if it’s not something meteorological related or storm chasing, then I usually do not feel like writing about it. Like a lot of other avid Discovery Channel (DSC) viewers, I have found the latest "Storm Chasers" series to be quite interesting — the latest in DSC’s "reality show" style of programming that has really grabbed viewers over the past couple years… along the lines of "Deadliest Catch", "Man vs. Wild", "Survivorman", among others — all of which I find very interesting to watch. 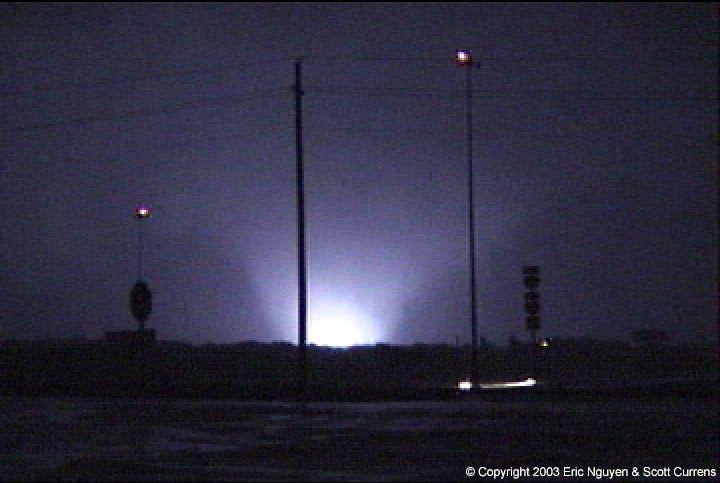 "Storm Chasers" is a 4-part "reality" series that was filmed during a ~6 week period from late April through May 2007. You can read more about it on DSC’s website. As a storm chaser myself, it is easy scrutinize or pick at this program with a fine-tooth comb given my familiarity with storm chasing… although not necessarily on the research side of storm chasing — that said, much of the trials and drama that is portrayed in "Storm Chasers" is very much experienced by all storm chasers — research or not. For this reason, I love the program. I have not seen one documentary, made-for-teevee movie, theatre movie, etc. that has portrayed what storm chasing really is. Just about all of "Storm Chasers" is really what you see happen to all storm chasers at some point — we all have to make the same forecast and tactical decisions to achieve our goals of the chase — whether they are research oriented trying to get as close to… or even in a tornado in TIV’s case — or fine-art photography of supercell storm structures like in my case (as you can see throughout my website). During their six-week stretch on the Plains, DOW, TIV, and the DSC crew made a visit to the National Weather Service in Dodge City where I work, and I had a chance to visit with Josh, Sean, and the rest of their team. The DSC crew was interested in interviewing me about the Greensburg storm, for obvious reasons, during their visit. 15-20 seconds of this interview of me was included in episode #3 of "Storm Chasers", about 3/4 towards the end of the show. Their "bust" of May 4, 2007, the Greensburg Day, rings very familiar with many storm chasers. We have all had busts like that. To me, this was like me re-living the June 12, 2004 "Mulvane" day all over again. 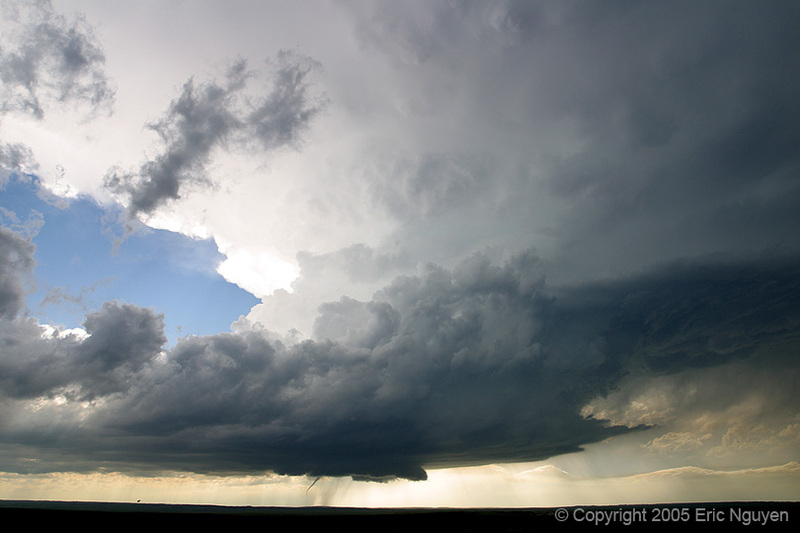 On this particular day, we chased crap storms in an area of north-central Kansas near the Nebraska border where it appeared that supercell storms and tornadoes would thrive. We actually had two targets that day — a southern target near Medicine Lodge as well… but we (Jay Antle and I) began the day up in Iowa, and we obviously opted for a closer target. 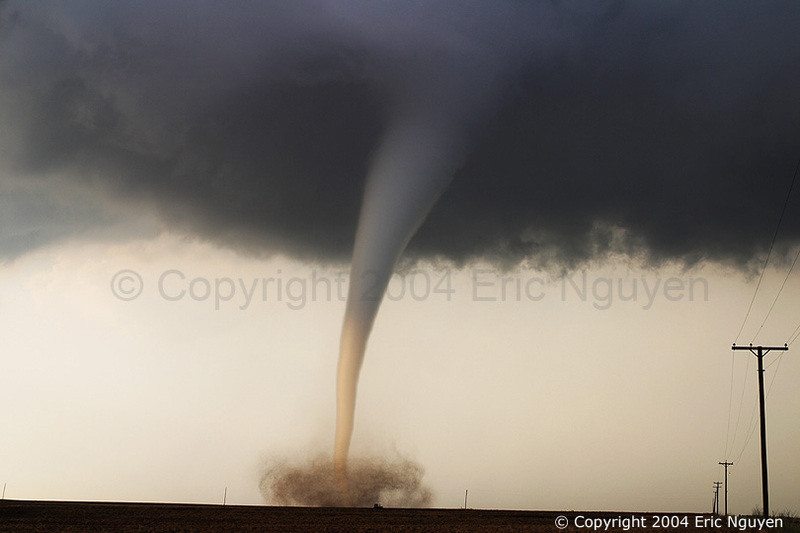 As it turned out, the southern target was the real winner on June 12, 2004 (from a storm chasing standpoint), much like the southern target was as well on May 4, 2007. Our day ended relatively early in the evening on June 12th, but we were too far away to make it down towards the Wichita area, so a friend of mine I met up with decided to just head down to Salina and drown our sorrows of the chase by heading to the bowling alley to bowl a few games – this is very similar to Sean Casey and the TIV crew drowning their sorrows at a local bar in Hays, KS on May 4th, 2007. 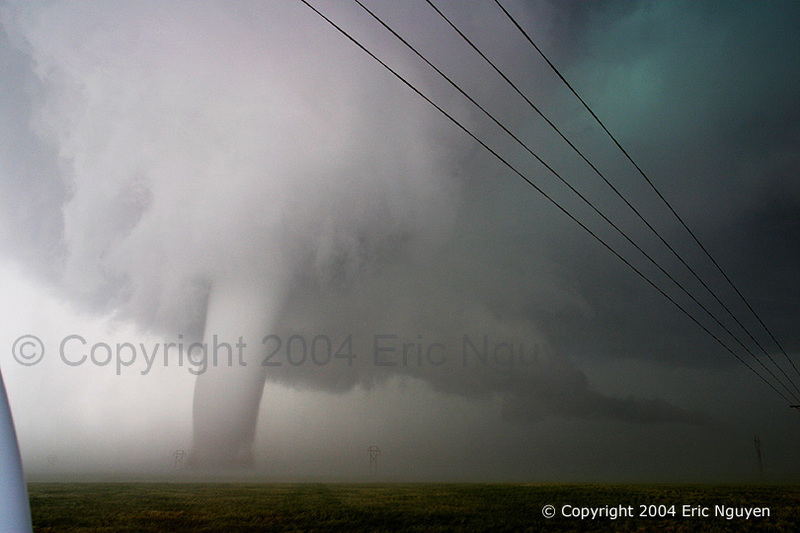 While at the bowling alley in Salina with my friend Christina that evening of June 12, 2004, there was a television on that we could see, and of course as we would know, they were showing severe weather coverage and video of this incredible, tall, photogenic tornado near Mulvane. I couldn’t believe what I was seeing, sitting there in that bowling alley on a chase day bust, watching this incredible tornado about 2 hours south of where we were — again, this is very similar to the TIV crew watching the news unfold of the Greensburg disaster at the bar they were at in Hays that night, and seeing the incredible video of the Arnett, OK tornado (what the DSC calls the "Woodward" tornado in episode #3) shot by other storm chasers. It was eerie how similar their fate was to mine of June 12, 2004. For those who chase a long time, it happens to all of us. It’s not easy to swallow. I think the DSC did a fantastic job of portraying this kind of emotion that can be brought on storm chasers. I have certainly received a lot of compliments and kudos about how "I" saved lives in Greensburg… I really appreciate the response and e-mails I have received. The interview I had with Diane Sawyer on GMA seemed to suggest that it was primarily me that saved lives in Greensburg — and that’s just not the case. At least that’s how I feel about it. I just want to make it clear to everyone that it was not just me. It is the integrated warning system that saves lives… not one and only one person’s sole individual effort. As the National Weather Service radar and warning operator, my job that night was the most "visible" part of this integrated warning system…thus all the compliments and wonderful feedback I have received (Which I thank you again). It is our job in the National Weather Service as meteorologists to issue timely warnings and statements when severe weather threatens people. We really did nothing out of the ordinary in terms of doing our jobs the way we are trained to do it that night. While I was the meteorologist working the radar and issuing statements for just that particular storm, other meteorologists in our office were making calls and receiving calls concerning reports of what was actually going on on the ground. One meteorologist from our office in particular called Kiowa County dispatch at least two times, and I think they called us once concerning the threat for Greensburg specifically. The very first time they called… about 30 minutes before the tornado hit… we told them.. at the time we did not think that Greensburg would take a direct hit given the latest track of the storm… however we did express some uncertainty in what we told them. About 10 minutes later, that particular meteorologist called Kiowa County back as it appeared that the Tornado Vortex Signature (TVS) on radar was turning more to the left… in line with Greensburg. This meteorologist told them that after we analyzed the latest extrapolation of the TVS. I think we gave them one more call about 10 minutes prior to it hitting that we had high-confidence they were going to take at least a partial hit… if not a direct one. Regarding the Tornado Emergency wording in one of our statements. As the radar operator for that storm, it was largely my decision… in other words… I wanted to use this wording in the statement text… and I ran this by our Lead Forecaster to see if he agreed, which he did, and we ran with it. We did monitor one of the Wichita TV stations in our office, as we usually do so that we can verify the dissemination of the warnings (at least from the TV media standpoint), and at the one TV station we were monitoring did indeed pick up on our "Tornado Emergency" text with the extreme wording to stress the severity of the situation. This TV meteorologist did a fantastic job conveying this threat from our statement… The upshot of this blog post is that it wasn’t just me. Many of the storm chasers were also in on the integrated warning system, too, as they were relaying real-time verification of the large, wedge tornado to their particular TV stations as well as reports coming into our office. Many people were involved on Friday May 4th that saved lives in Greensburg, Kansas and surrounding areas that took direct hits. A "career" storm… from a radar operator standpoint. It’s 3:00am, I’m still up, but should be going to bed, but I’m just too darned keyed up. Where do I begin? The storm of the day erupted at the southernmost end of a cluster of pseudo-organized right and left members to its immediate north. But the far southern storm that erupted out of nowhere just had that shape. Not 2 minutes after I issued SVR again for eastern Clark Co for that storm I issued TOR… I didn’t have to wait for strong 0.5 convergence/couplet, whatever. It took it awhile to get going… about Protection or so… but when it did… it went on to produce a fantastic velocity signature 0.5/0.9 slices north of Protection. The couplet was tracking more northeast… missing Coldwater to the northwest and approaching highway 183 about 7 SSW of Greensburg. Velocity rotational couplets were topping out at around 150 knots total shear over about a 1-2 mile radius. I was just thanking the lord that it appeared to be taking a course to miss Greensburg to the southeast. The next couple slices, though, frightened me. The damn couplet was bending to the left…and the next scan was even more to the left… and I didn’t even really give it thought… the "…tornado emergency for Greensburg…" in my next SVS… it was like instinct – just did it. Those few minutes after watching one of the most incredible velocity couplets go directly over one of your good sized communities in your CWA… I was just too anxious. Then the message was sent out… a plea from Greensburg dispatch… "Ford County communications this is Greensburg… we just took a direct hit…".. that came no more than about 3 or 4 minutes after the couplet passed over. I then immediately sent out another SVS indicating that Greensburg likely took a direct hit. Thereafter… the steady-state cycling of tornado cyclone…tornado…left turn…. 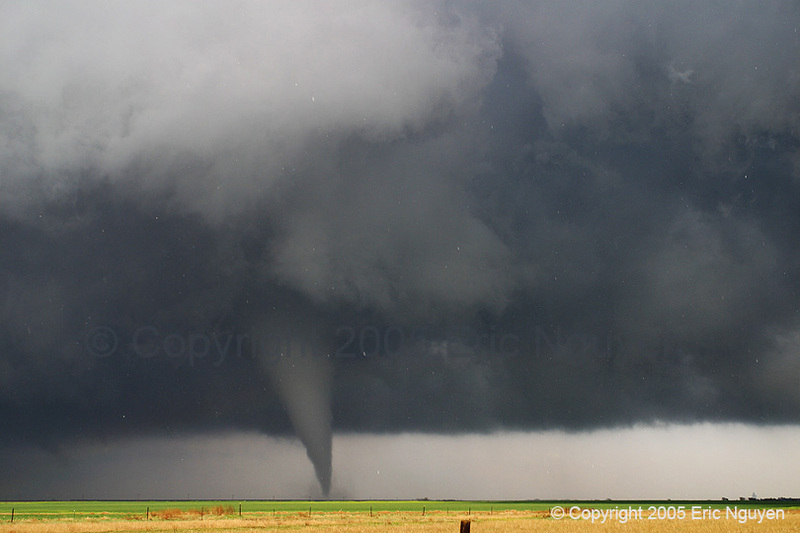 next cycle… tornado, left (north) turn…. next cycle… it was routine… the most steady-state cyclic significant tornadic supercell I had ever seen, let alone work the warnings on radar. I don’t think that there was 1 minute from the time of the first tornado near Protection….to the time it exited our CWA and headed into the Ellinwood area…that there wasn’t a significant tornado tearing $h1t up….over that 100 mile stretch. 100 miles of steady-state tornado production… I’m not sure how many members there were in this wedge-family. Just to see hours on end of velocity signatures like this is something I’ll never forget. Inbounds of 120 knots and higher at times… inbounds only! Several times throughout the life! I think the highest we saw was about 150 knots that actually looked like legit data… as in properly aliased. Greensburg is pretty much gone. Especially the western 1/2 of town from what I can surmise from the media reports and interviews. How many of you are familiar with the Largest Hand-dug Well? There’s a tall tower that stands proud above that well. No more. Completely gone, at least from one of the accounts I heard. The Big Well is located in the heart of town… and the reports are that downtown and the western portions of town suffered the worst of the damage. One account I heard of was that when one of the residents looked out their window… they couldn’t see the tower anymore. They didn’t know where it went. One of my favorite storm photos of the year so far included Greensburg in the shot. 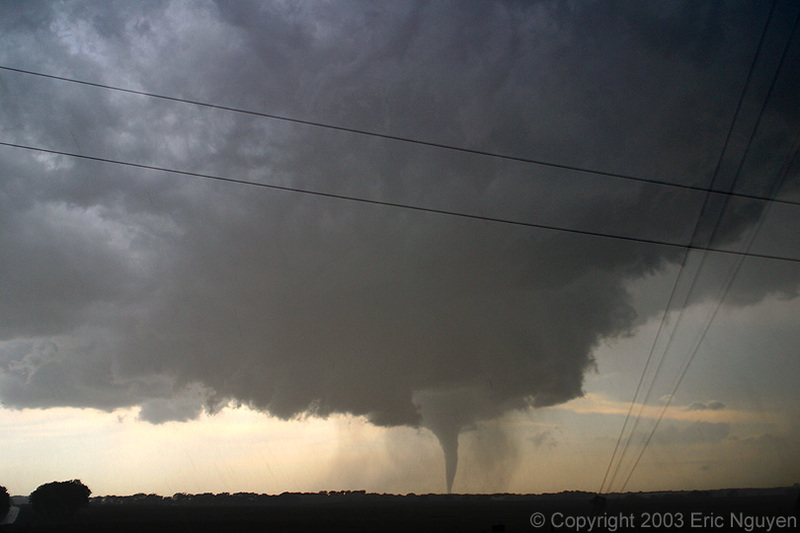 This was taken about 5 miles west of Greensburg back on March 29th. This is a painful entry… but I will feel better if I at least type something. My beloved alma-mater… the University of Kansas Jayhawks… were defeated once again in the first round of “The Big Dance” by the Bradley Braves, a team who clearly no one knew much about… at least I didn’t (and the KU team itself, by the looks of the game! )… and pretty much wrote this game off as a “should-win”, looking ahead to a fairly competitive match-up against Pitt. I sat and watched this game this evening, and I felt like I had gone back in time…. to a time about 4 months ago when young frosh were running up and down the court tossing the rock like it was a hot potato with every other possession resulting in an unforced turnover. What really makes a game like the game against Bradley so difficult to swallow is the fact that we came off one of our best games of the year last week against a good Texas team. Granted, I didn’t watch that game, but rather listened to it on the radio at work, but it amazes me how a team can go from such a stellar performance to something so unbelievably full of mistakes… like it was the first time the school ever played in a big tournament. Hah.. reminds me of my bowling, quite frankly — the up and down. That’s the way a team will play, though, without senior leadership. I think the coaching staff can only provide so much motivation. There needs to be on-the-court leadership, and quite frankly the very young Jayhawk team has NONE. The two seniors we do have — Moody and Hawkins, do not provide much in the way of leadership because they are not on the court often enough to be leaders (How about a total of 16 minutes between the two of them? How’s that for on-the-court leadership?). They just aren’t as talented as our younger crew. Our age showed big-time… and it was exposed tremendously by a much more eager-to-win Bradley club. I watched my young Hawks and I just saw a lack passion and obviously experience. The sophomore crew were freshman against Bucknell last year, so they gained little tournament experience last year. It’s as if they knew they were better than Bradley and just mentally didn’t have it in them… whether that was because they were emotionally fatigued still from that big Texas win… or were looking ahead to Pitt… or knew “they were all that” after the Texas win… or a combination of all the above. I don’t know what it was, but there was no desire or passion out there on the floor. I am still having a hard time putting my finger on Brandon Rush. He has been our highly touted freshman star all year… but I’m just not seeing the fire in Rush. He’s definitely not ready for the NBA, that’s for damn sure. I’m seeing much more passion out on the point with Chalmers and Robinson. These two guys will end up being the leaders on this team… especially Russel Robinson. Someone has to step up BIG-TIME if the Hawks are going to compete with serious competition on a consistent basis. Bucknell and Bradley are NOT serious competition! So now I’ll root for Wichita State against Tennessee tomorrow… it’ll be interesting to see how that turns out. It would be one of the biggest wins in the WSU program in a long, long time (if not in the history of WSU Basketball), and a huge recruiting kick for Mark Turgeon. Wichita State is looking up, and that’s awesome to see. Now time to “try” and get into Royals Baseball season now. It’s difficult being a KU Basketball, Royals, and Chiefs fan. Storm chasing has certainly taken on a whole new meaning when it comes to tropical storms – especially over the past couple of years, as there has been an exponential growth in Great Plains chasers who seek to chase these incredible natural phenomena. It used to be that the limit of hurricane chasing would be high-end Category 2 type storms, at least when it comes to chasing the eye – or at the very least, get to within 5-10 miles of the coast to witness the eye before it “fills in”. There are several elements of the hurricane intercept and documentation that are lures to many who chase them. The experience of the eye. The incredible local variations in wind speed, direction, and pressure in a matter of only minutes. The Surge. Water in motion that cannot be explained unless you are there. And the wind itself. It must be incredible to witness firsthand. Hurricane chasing is a logistical nightmare. You have to deal with power outages, shortage of fuel, shortage of food/water and even shelter. Especially in times of mandatory evacuations. After everyone has fled, including emergency response personnel, you are pretty much on your own, and when you try to leave, what about washed-out roads and litter of debris? It is these very reasons that I have no interest in the hurricane chase. There are others, however, who prepare for these very things in order to acheive the fullest in their experience. Hurricane chasing, for those that do it most ethically and SAFE, are really photojournalists. It goes beyond just storm chasing. It is not simply just to get the shot, but to also tell a story. 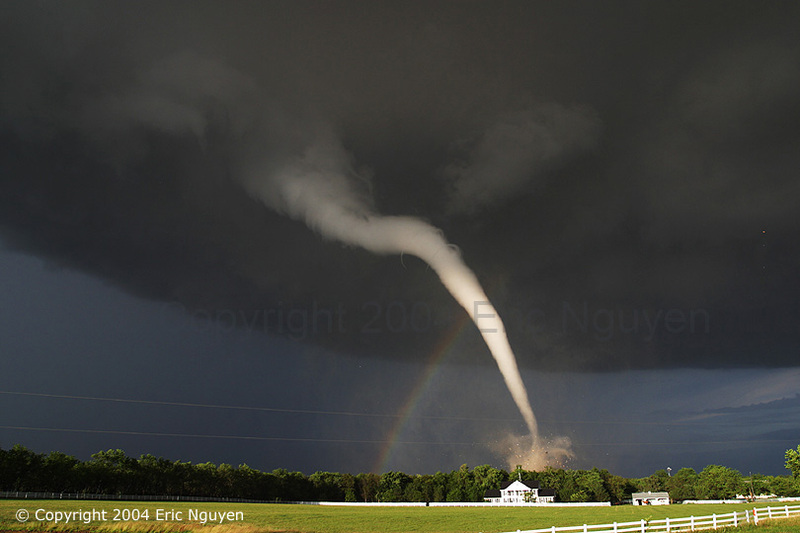 The photojournalistic aspect to “tell the story” has prompted a few of the most passionate and dedicated hurricane chasers to push the limits of human capability to get these shots in the most extreme conditions. 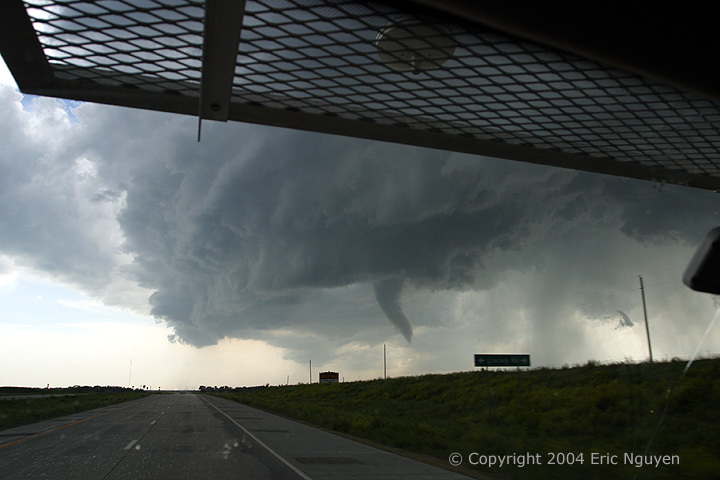 I think Hurricane Katrina certainly showed which chasers/photojournalists indeed are willing to take more risk. The risk-takers are the photojournalists who make a living out of it. 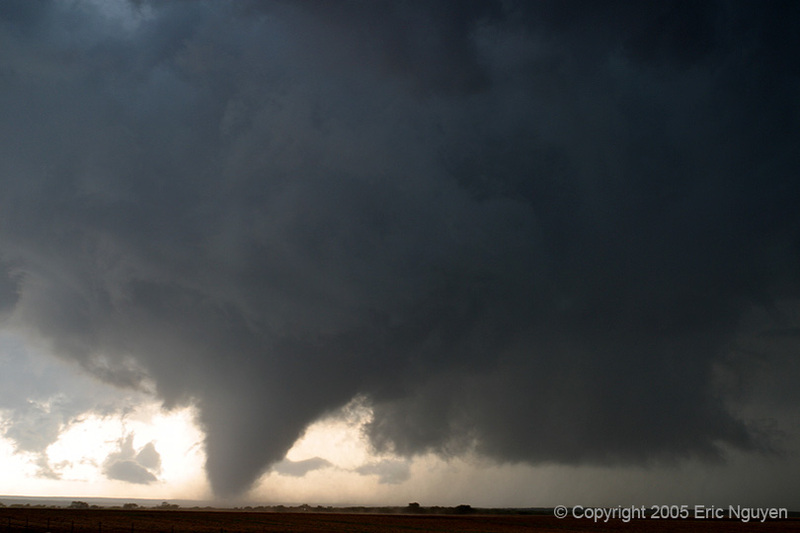 A few of the chasers/photojournalists have become more well-known among the storm chasing community (and beyond) based on their most recent work the past couple of years, including Jim Reed, Doug Kiesling, Chris Collura, Jeff Gammons, Mike Theiss, Jim Leonard, and Jim Edds… just to name the most reputable ones. I think there is a fine line, however, between these photojournalists mentioned above and those chasers who just simply shouldn’t be there; the chasers who don’t necessarily prepare for the intercept properly and are more of an obstacle to those around them than anything else. One such case from Katrina was from these guys. The “Stormgasm” crew, according to their accounts, appeared to be unprepared for their intercept and got to the point where they had to physically be rescued by a rescue boat. Over the past couple of years, these guys have developed a fairly poor reputation among the chasing community for their extreme chasing tactics and poor ethics – particularly their very controversial June 2004 Manchester tornado video when at least one member of their crew was dancing and frolicking as a tornado blew away a farm house. Hurricane chasing/journalism is dynamic, and I know that I certainly have no future intentions of chasing hurricanes, simply because I know that there are just too many unpredictable things that can lead to very unsafe situations. I will stick with supercell thunderstorms, simply because I understand these storms far better and their damage capabilities are far more localized than hurricanes, and that is the bottom line for me. I’m not out to photograph/videograph destruction, but rather the artistic beauty of the atmosphere. For me, the artistic beauty of hurricanes is the view from above; the high-resolution imagery taken from satellite. This is absolutely amazing to me, and I’ll continue admiring from afar. That said, I respect my hurricane chasing friends Jim Leonard and Jim Reed, especially, because time and time again, they get it done right, even if they do put their life at risk, and they share their stories and photography/videography around the world allowing ordinary citizens vulnerable to these storms to gain a true appreciation for what the atmosphere and ocean can really do. The Katrina Aftermath and New Orleans. This is no longer a natural disaster. This has rapidly spiralled into easily the worst humanitarian catastrophe in the history of this great country. It’s 4:30 am, and I just finished listening to a recorded interview from Nagin, the Mayor of New Orleans himself, on the WWL radio station from NO. It is now Day 4 of this crisis and the anger and frustration from the mayor of NO has grown to a boiling point. It was the most frightening, to-the-point “slamming” of the entire governmental chain of the United States I have ever heard, regarding the complete inept in utilizing all the resources capable to SAVE LIVES. The mayor cussed. He has completely lost faith in the entire governmental chain from State to Federal. He is right. What the hell is going on here? Cable news network reporters in the field are saying the SAME THING!! An interview of the LA Governer by Anderson Cooper had the same tone.. Where is the HELP??!? All this talk but no action, and it was Thursday… The hurricane made landfall MONDAY MORNING. It has gotten to the point now, that the death rate among those still left out there grows exponentially with every passing hour. Hundreds, to perhaps THOUSANDS of lives that otherwise would have been SAVED had a plan been in place. It appears as if there is no ultimate plan, no one single leader to head up this plan… There are “too many cooks in the kitchen” as Mayor Nagin has said. Obviously, the scale of this disaster has stretched resources extremely thin. It doesn’t help that we spend billions and billions and BILLIONS supporting an Iraq mission that in and of itself has many questions. What’s left for US?? US being home… The United States. Clearly, we are a nation prone to extreme national disasters. Though events like this are rare, maybe 100 or 200 year events, they happen. There is simply NOT ENOUGH THINKING OUTSIDE THE BOX in American Government. And it disturbs me.